Medicinal uses: Fruits and extracts are used to treat diarrhea and inflammation of the mucous membranes of the mouth and throat. Improves cardiovascular system and vision. Leaves used against diabetes, arthritis, gout, poor circulation, and complaints of the digestive system, kidneys, and urinary tract and externally against mucosal inflammations, dermatitis, hemorrhoids, and other skin conditions. Nutritional information: They are an excellent source of flavonoids, especially anthocyanidins. These antioxidant compounds are responsible for the blue, purple, and red pigments. 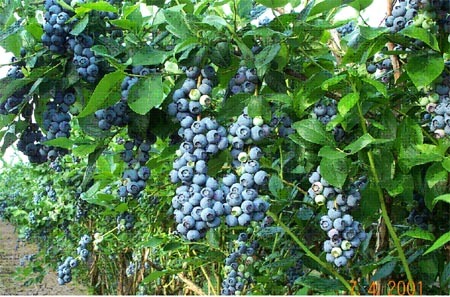 Blue berries are also a very good source of vitamin C, soluble and insoluble fiber, including pectin. They are also a good source of manganese, vitamin E, and riboflavin (Murray 259). Cautions: Do not take the leaves for longer than 3 weeks at a time (Chevallier 147).